In Power BI Desktop, privacy levels specify an isolation level that defines the degree that one data source will be isolated from other data sources. Although a restrictive isolation level blocks information from being exchanged between data sources, it may reduce functionality and impact performance. 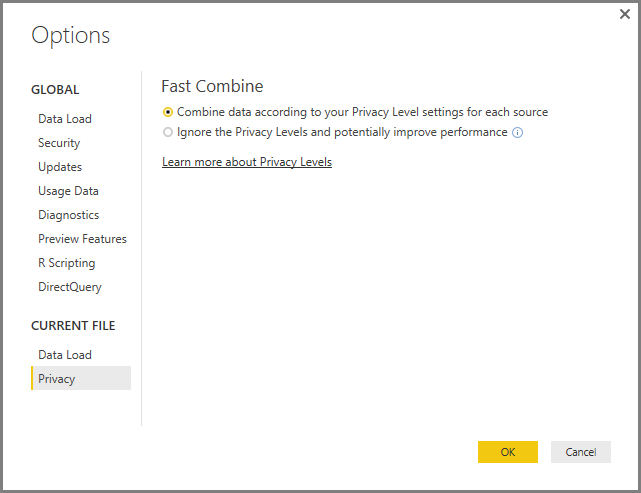 The Privacy Levels setting, found in File > Options and settings > Options and then Current File > Privacy determines whether Power BI Desktop uses your Privacy Level settings while combining data. 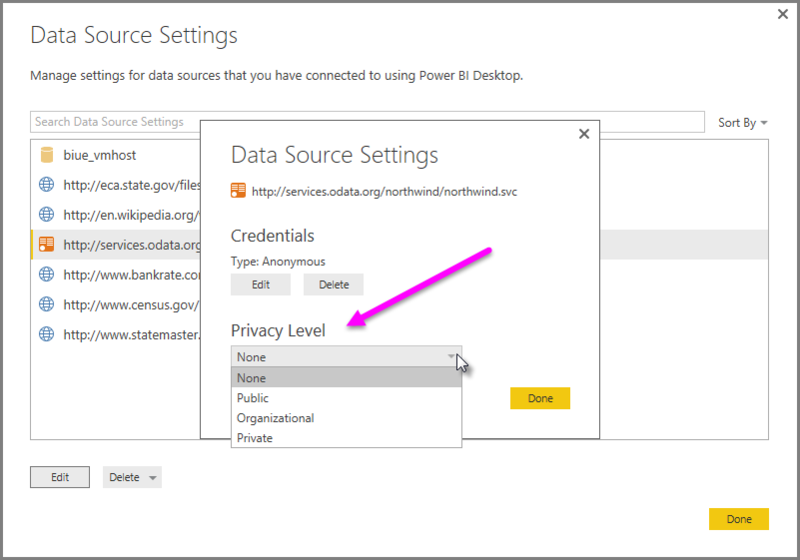 This dialog includes a link to Power BI Desktop documentation about Privacy Levels and Privacy Levels (this article). Private data source A Private data source contains sensitive or confidential information, and the visibility of the data source may be restricted to authorized users. A private data source is completely isolated from other data sources. Facebook data, a text file containing stock awards, or a workbook containing employee review information. Organizational data source An Organizational data source limits the visibility of a data source to a trusted group of people. An Organizational data source is isolated from all Public data sources, but is visible to other Organizational data sources. A Microsoft Word document on an intranet SharePoint site with permissions enabled for a trusted group. Public data source A Public data source gives everyone visibility to the data contained in the data source. Only files, internet data sources, or workbook data can be marked Public. Free data from the Microsoft Azure Marketplace, data from a Wikipedia page, or a local file containing data copied from a public web page. The Privacy settings dialog for each data source is found in File > Options and settings > Data source settings. To configure a data source privacy level, select the data source, then select Edit. The Data Source Settings dialog appears, from which you can select the appropriate privacy level from the drop-down menu at the bottom of the dialog, as shown in the following image. You should configure a data source containing highly sensitive or confidential data as Private. Privacy Levels is a setting that is set to Combine data according to your Privacy Level settings for each source by default, which means that Privacy Levels is not enabled. Combine data according to your Privacy Level settings for each source (on, and the default setting) Privacy level settings are used to determine the level of isolation between data sources when combining data. Ignore the Privacy levels and potentially improve performance (off) Privacy levels are not considered when combining data, however, performance and functionality of the data may increase. Security Note: Enabling Privacy Levels by selecting Ignore the Privacy levels and potentially improve performance in the Privacy Levels dialog could expose sensitive or confidential data to an unauthorized person. Do not enable Privacy Levels unless you are confident that the data source does not contain sensitive or confidential data. The Ignore the Privacy levels and potentially improve performance does not work in the Power BI service. As such, Power BI Desktop reports with this setting enabled, which are then published to the Power BI service, do not reflect this behavior when used in the service. In Power BI Desktop or in Query Editor, select File > Options and settings > Options and then Current File > Privacy. a. When Combine data according to your Privacy Level settings for each source is selected, data will be combined according to your Privacy Levels setting. Merging data across Privacy isolation zones will result in some data buffering. b. When Ignore the Privacy levels and potentially improve performance is selected, the data will be combined ignoring your Privacy Levels which could reveal sensitive or confidential data to an unauthorized user. The setting may improve performance and functionality. Security Note: Selecting Ignore the Privacy levels and potentially improve performance may improve performance; however, Power BI Desktop cannot ensure the privacy of data merged into the Power BI Desktop file.